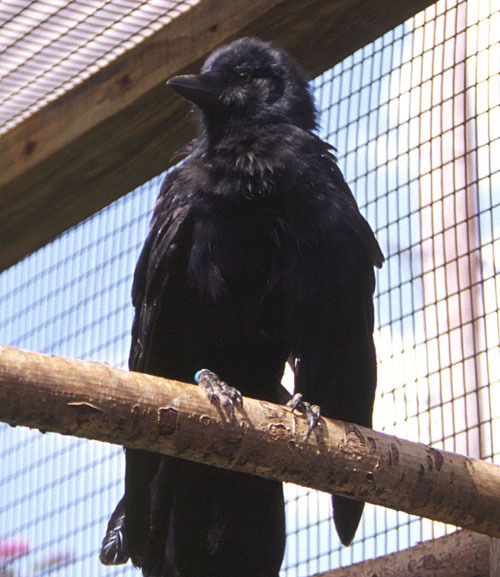 with the image number you want, or click the "Click here to request this image" link under the image you are interested in. 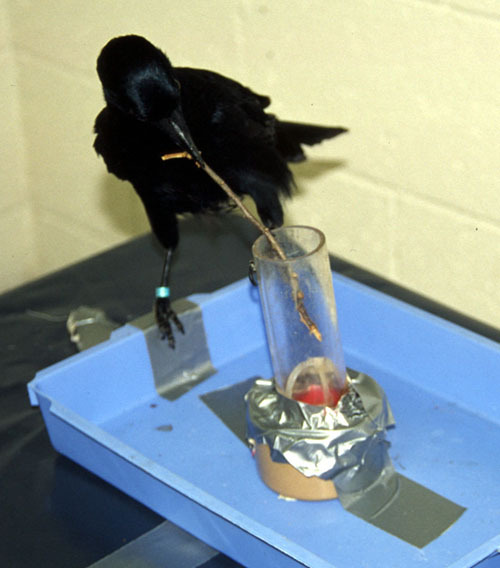 Description: From the hook/wire experiment, this shows Betty holding a piece of wire she has just bent. 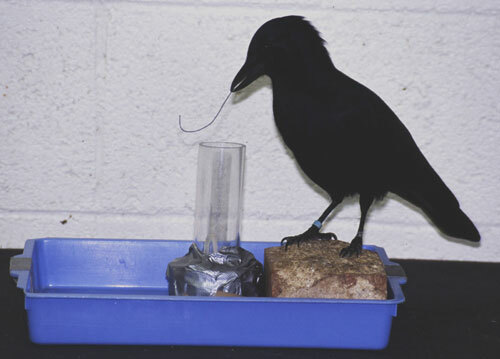 Description: From the hook/wire experiment, this shows Betty just after she's retrieved the bucket from the well. You can see the meat inside the bucket. Description: This shows Abel retrieving a bucket from the well using a stick with a hook on the end of it. 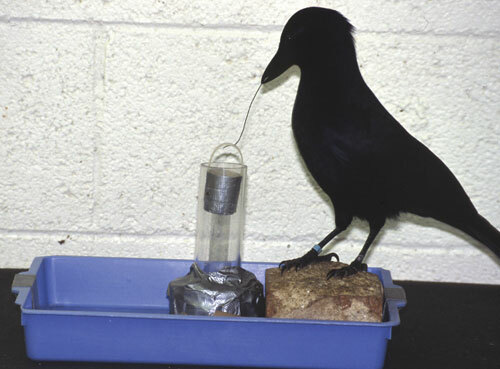 This experiment preceded the hook/wire one above. 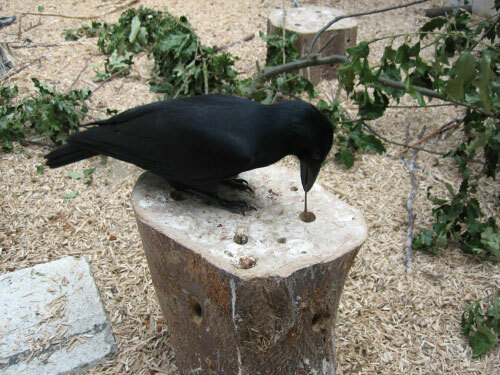 Description: This shows Abel eating the meat he has just retrieved from a bucket from the well, using a stick with a hook on the end of it. 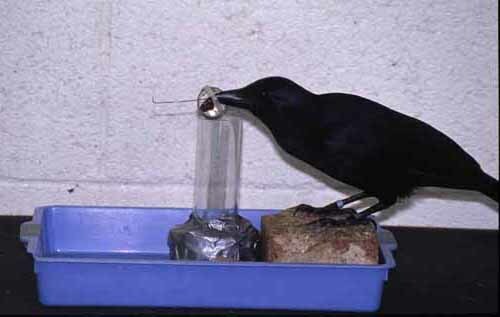 This experiment preceded the hook/wire one above. 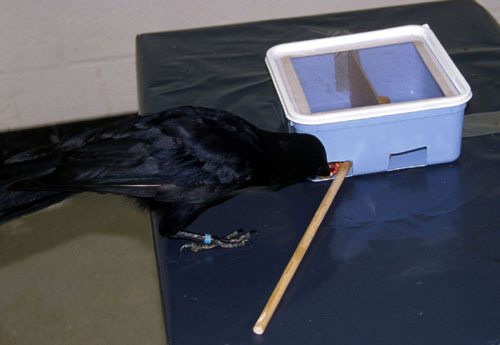 Description: This shows Betty trying to retrieve the bucket from the well, using a stick with a hook on the end of it. 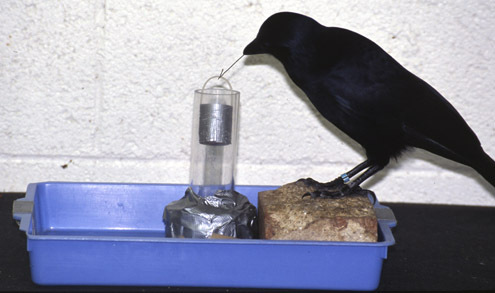 This experiment preceded the hook/wire one above. 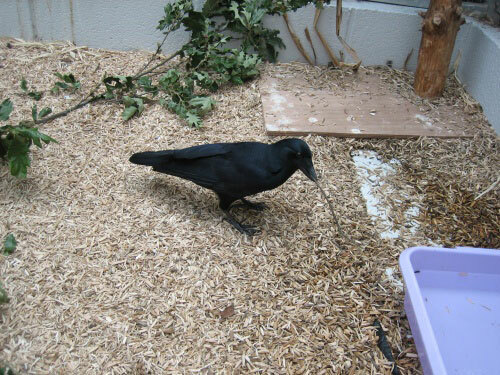 Description: This shows Betty trying to retrieve the bucket from the well, using a stick with a hook on the end of it (but using it the wrong way round, with the hook in her beak). 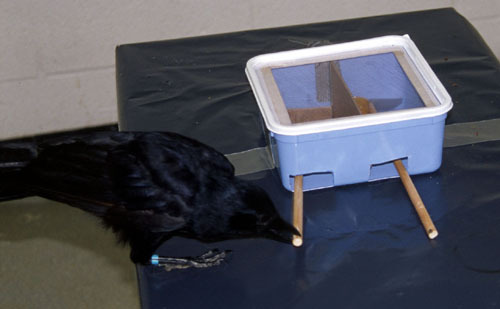 However, she is able to get the bucket this way, which is the reason this experiment was not continued. 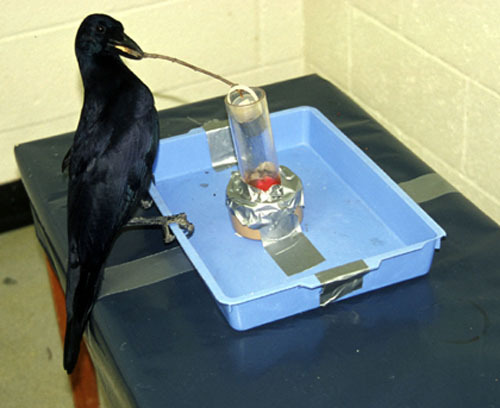 This experiment preceded the hook/wire one above. 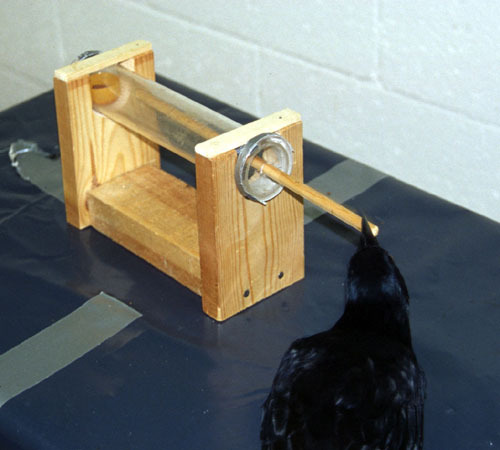 Description: This shows Betty in a "folk physics" experiment. Her task was to pull the correct rake towards her, dragging along a bucket of meat. One of the rakes had a stiff cross-piece and the other a floppy one, so she had to choose the correct one (on the left, here). 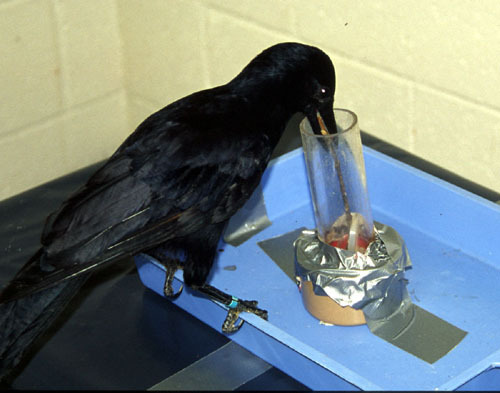 Description: This shows Betty just completing a trial in a "folk physics" experiment. Her task was to pull the correct rake towards her, dragging along a bucket of meat. One of the rakes had a stiff cross-piece and the other a floppy one, so she had to choose the correct one (on the left, here). 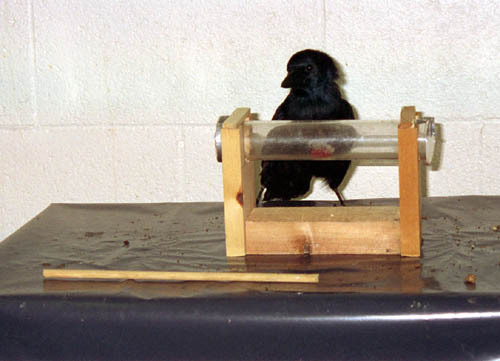 Description: This shows Betty looking at the apparatus for a "pushing" experiment. Her task was simply to push the meat out of the tube using a stick. 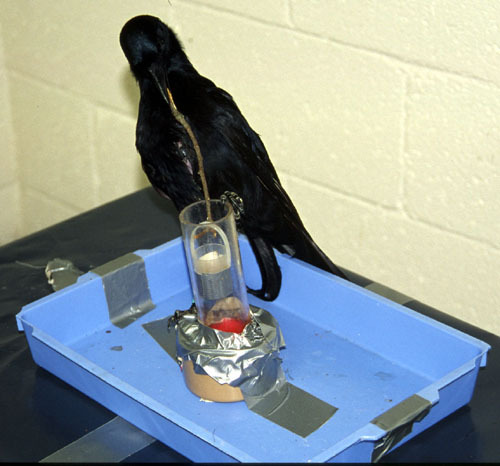 Description: This shows Betty just after completing a trial in a "pushing" experiment. Her task was simply to push the meat out of the tube using a stick. 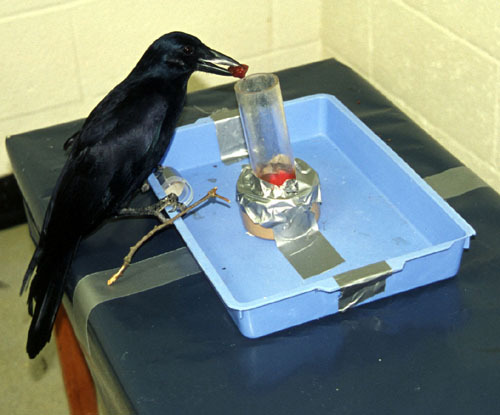 Description: This shows Betty using tools in her aviary (Abel is also visible on the left). 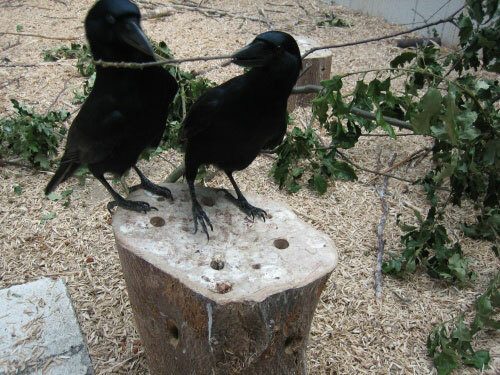 She has made this tool out of oak branches in the aviary, and is using it out of an experimental context. 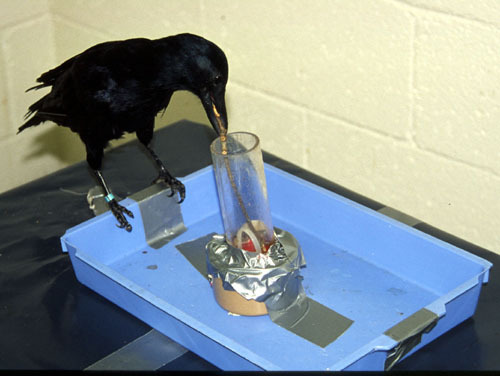 Description: This shows Betty using tools in her aviary. 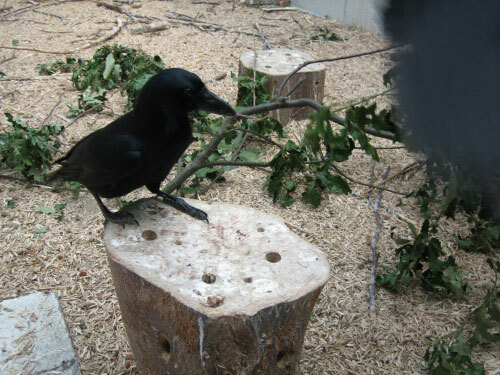 She has made this tool out of oak branches in the aviary, and is using it out of an experimental context. 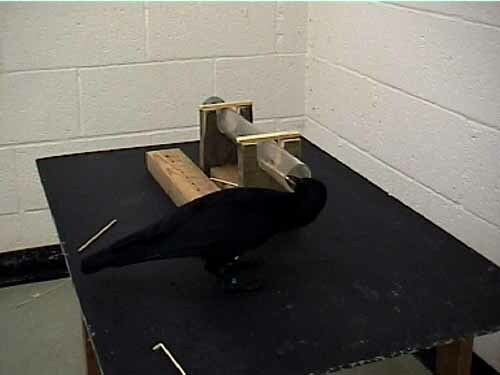 Description: This shows Betty in a length selection experiment (see Chappell & Kacelnik, 2002 Animal Cognition 5:71-78). 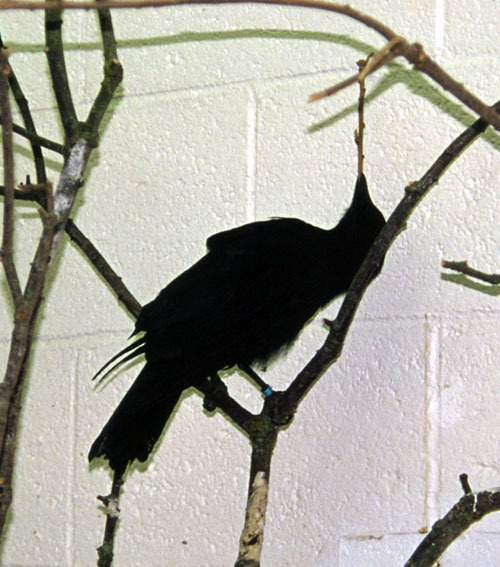 Her task was to select a stick of sufficient length to retrieve the meat from the tube. This is a still from a video, so is not available in very high resolution. 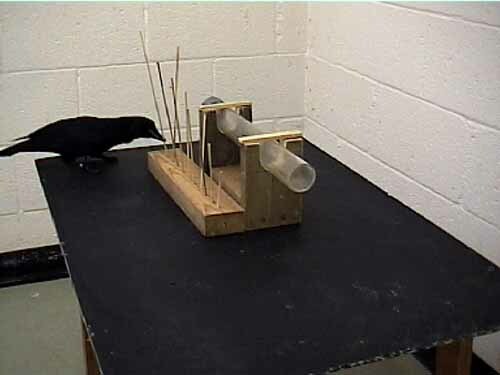 Description: This shows Betty just completing a trial in the length selection experiment (see Chappell & Kacelnik, 2002 Animal Cognition 5:71-78). 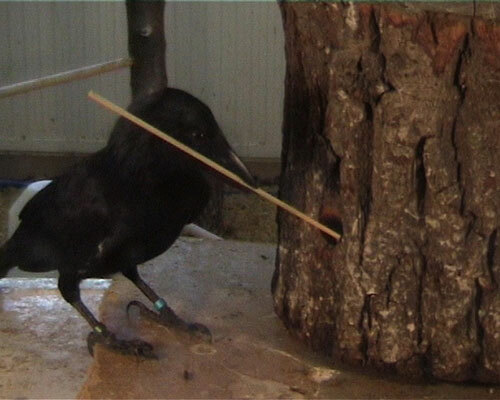 Her task was to select a stick of sufficient length to retrieve the meat from the tube. This is a still from a video, so is not available in very high resolution. 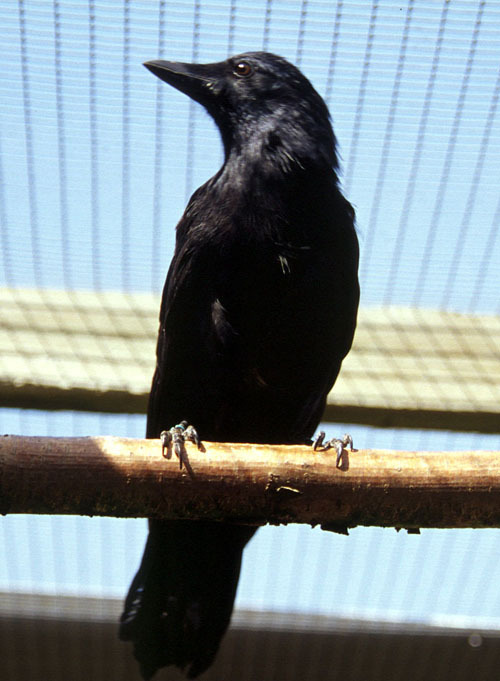 Description: This is a portrait of Abel in the old outside aviaries. Description: This is a portrait of Abel in the old inside room. 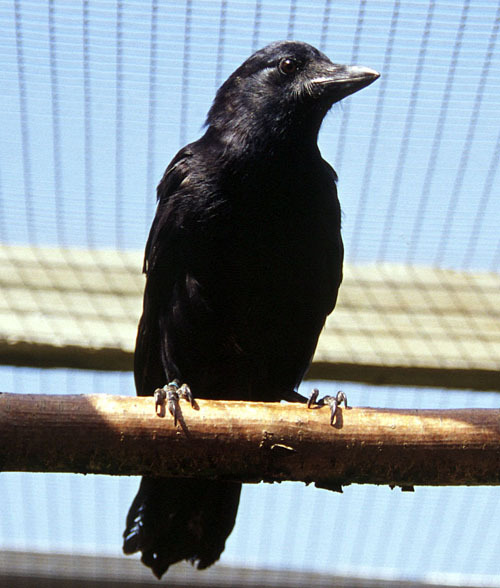 Description: This is a portrait of Betty in the old outside aviaries. 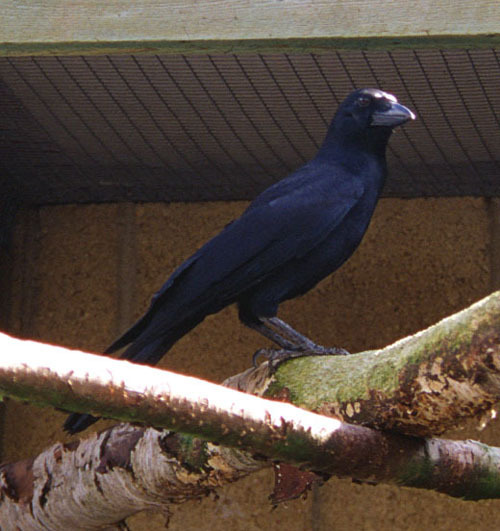 Description:This is a portrait of Betty in the old outside aviaries. 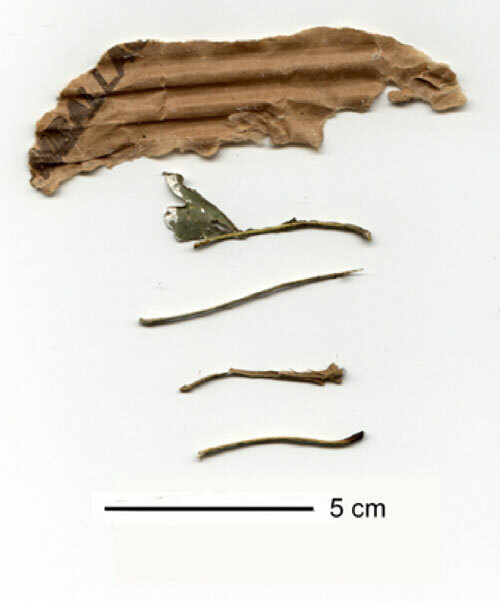 Description: This shows tools Abel and Betty made and used out of cardboard and leaf petioles. As these were directly scanned in, we do not have this photo at very high resolution. 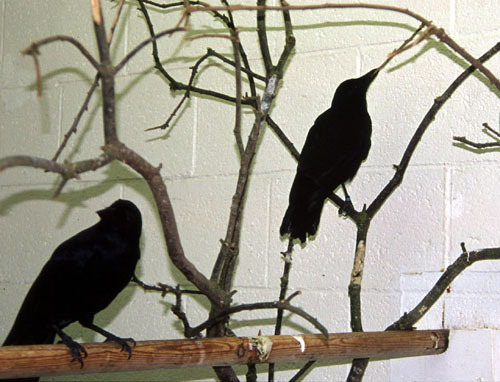 Description: This shows tools Abel and Betty made out of their own feathers. 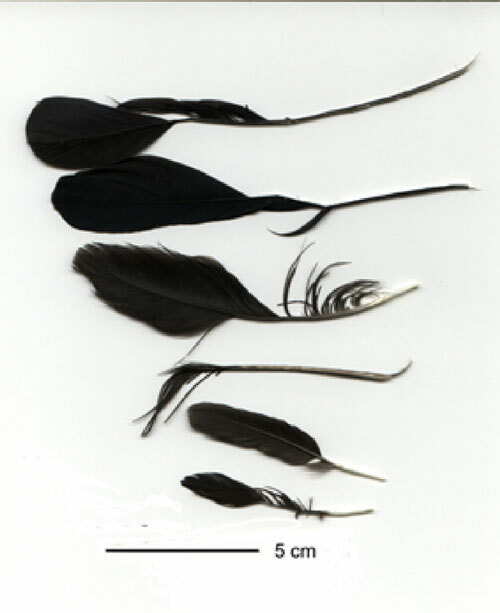 They remove the barbs from long feathers, and then use the stem formed by the quill and shaft. As these were directly scanned in, we do not have this photo at very high resolution. 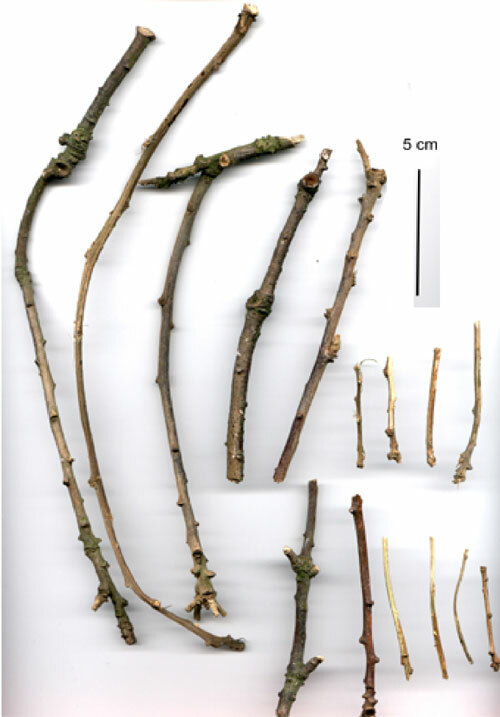 Description:This shows tools Abel and Betty made and used out of twigs. As these were directly scanned in, we do not have this photo at very high resolution. 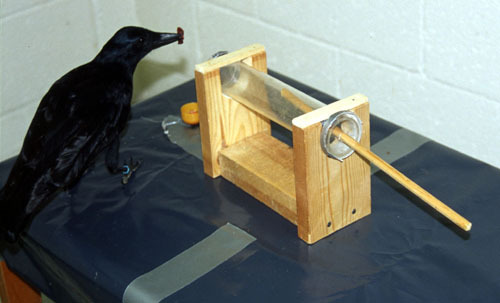 Description: This shows crow BG using a tool right-laterally. See 'Handedness' for more details. Note that this is a still from a movie clip, so very high quality is not available. 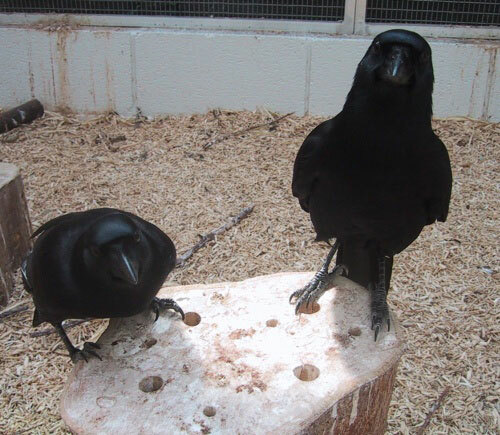 Description: This shows two hand-raised crows, Uek and Nalik. See 'Development' for more details. 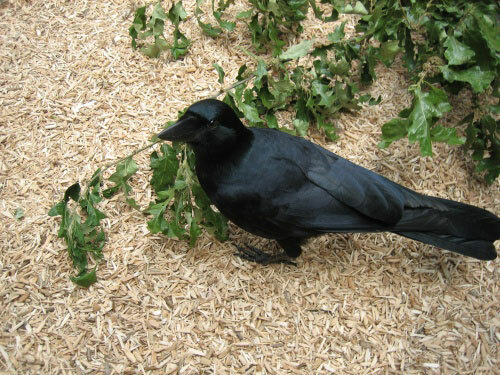 Description: This shows a hand-raised crow, Uek, shortly before making a tool from an oak branch. See 'Development' for more details. 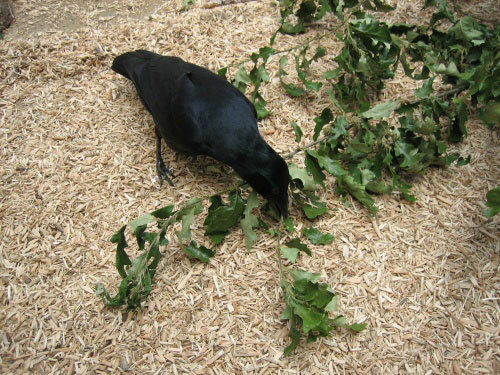 Description: This shows a hand-raised crow, Uek, making a tool from an oak branch. See 'Development' for more details. 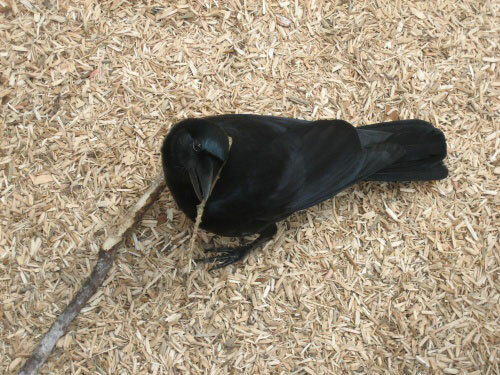 Description: This shows a hand-raised crow, Uek, holding a tool she has just made from an oak branch. See 'Development' for more details. 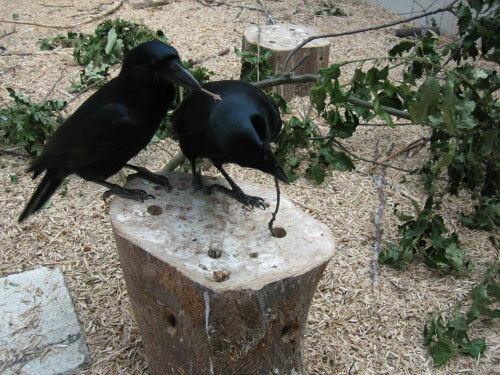 Description: This shows two hand-raised crows, Uek and Nalik, on a tree stump. Uek appears to be attempting to displace Nalik. See 'Development' for more details. 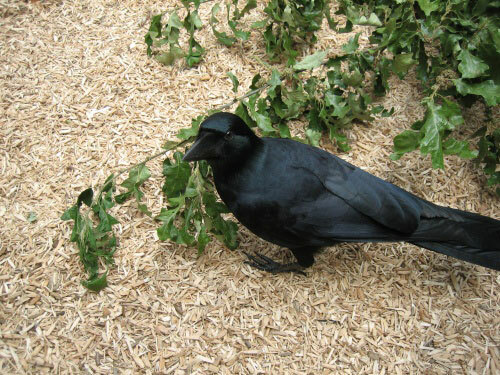 Description: This shows a hand-raised crow, Uek, holding a tool while standing on a tree stump. See 'Development' for more details. 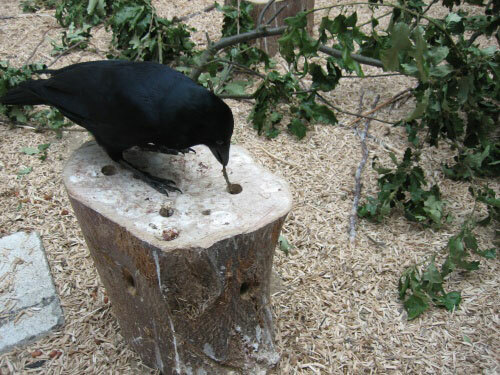 Description: This shows a hand-raised crow, Uek, probing into a hole in a tree stump. See 'Development' for more details. 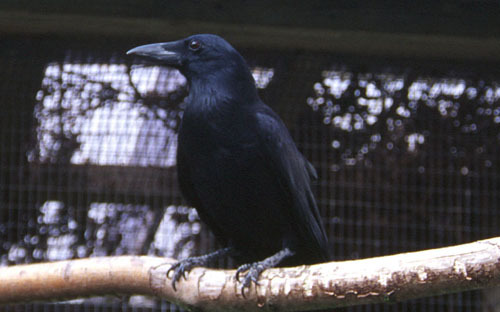 Description: This shows a hand-raised crow, Uek, looking at the camera with a tool in her beak. See 'Development' for more details.